This guide will let show you how to use identity verification app to protect your Microsoft Account, and safeguard it with two-step verification. Most of the world either uses a Microsoft account or a Google account. This is because, a single Microsoft or Google account lets us to use all the Microsoft or Google services, respectively. Hence it also means that if you lose this single email account, you’ve lost access to the associated services too. Thus, in order to protect your account, you must increase the security checks for it. We all are already aware of two-step verification for email accounts. In this scheme, we need to connect our email account to a mobile number. So when we sign in, a text or a call is received on the associated mobile that states a code which can be used to verify identity. But now we have yet another strong and advanced method to secure our Microsoft account. In this method, instead of text or call to a mobile, we use an app to authenticate our identity, the app used is thus Identity Verification App. This is a part of Multi-Factor Authentication (MFA) to safeguard your account presence. 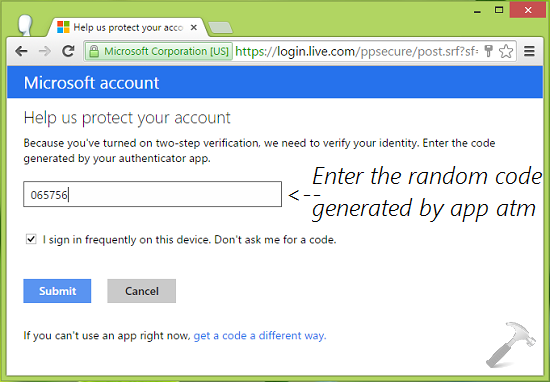 So without any delay, let us see how to use an Identity Verification App to protect your Microsoft account. This requires to have a Microsoft account and a smartphone or tablet. 4. Now, in this page, you have to scan the bar code using the authenticator app on your smart device. For example, we scanned the bar code using Google authenticator app on an iOS device. It generated a six digit code, which you have to enter in above shown page. Click Next. 6. 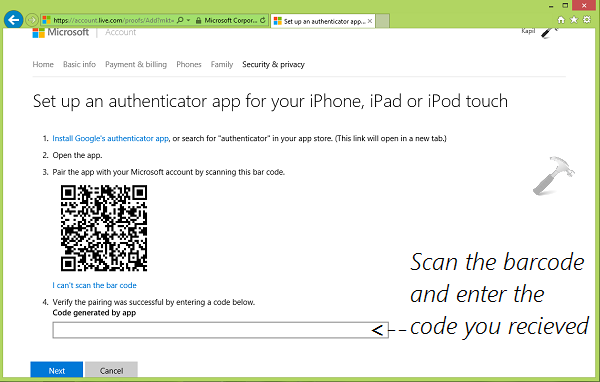 Finally, next time, when you sign-in to your Microsoft account, open the authenticator app and see the 6-digit code. The app generates the code automatically and randomly, even if it is offline. But good thing is that code always work, provided that you enter it, as soon as you see it. You can check the I sign in frequently on this device option to remember you. Clicking Submit will now take to your account. Hope this helps you to safeguard your account! Also see: How to recover your compromised Microsoft account. Many thanks for this article. I was just looking something like this!